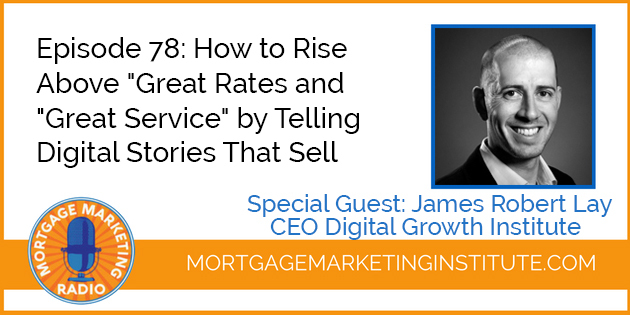 On the episode, we’re talking about getting away from the “great rates and service” with James Robert Lay; CEO at Digital Growth Institute. He’s on a mission to simplify digital marketing so banks, credit unions, you, the mortgage loan officer, can become digitally savvy – and grow your business. We’re talking about the convergence of digital change and disruption and displacement and how do you survive and thrive in the coming shifts that are happening in the mortgage space with regards to technology. James spends a lot of time working with financial institutions on mapping out their process to design the customer experience. Both from the point of lead generation, to engagement, to during the loan process and then post close. We’ll talk about how you become a modern mortgage professional, integrate technology in a way that engages the user and positions you as relevant and helpful. That’s what we’re going to talk about here on this episode and more. So, hope you enjoy the show. If you like so, please let us know. Leave a review. Check out links to James Robert Lay and his company, the Digital Growth Institute and you’ll find links to his company in the show notes at Digitalgrowth.com. How Do You Become a Modern Mortgage Professional?